If you're having trouble keeping lines on the glass while grinding or sawing, this pen will solve your problem. 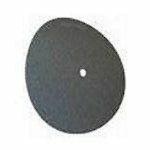 Use on clean dry glass and allow to dry before sawing or grinding. The color will stay until you completely grind or saw down to where you need to.